When you're a rookie heading into the cauldron that is the NFL, particularly when you might be replacing a future Hall of Famer, it's important to make as strong an impression as possible. 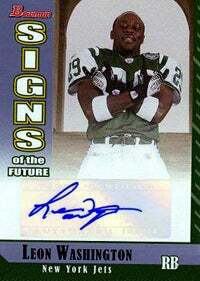 As pointed out by PopJocks, Jets running back Leon Washington appears to have chosen the "flip off the camera on your rookie card" technique of standing out. Intriguing way to go about it; rather Billy Ripken-esque. By the way, if we ever had a baseball card, This is without question the expression we'd be making.